Ready to broaden your keyword research? Today we’ve implemented 62 new country databases in Keyword Magic Tool, аn easy-to-use keyword research tool that provides all the keywords you need to build your most profitable SEO or PPC campaign. 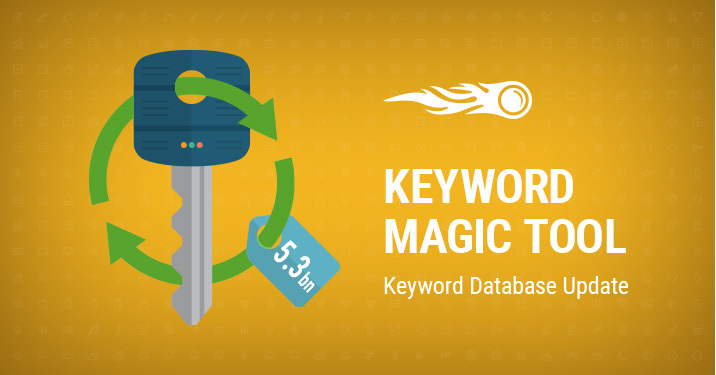 Now the total number for your keyword research exceeds 5.3 billion using Keyword Magic Tool! This gives you more opportunities in exploring niche topics, and finding semantically related and long tail keywords. If you’re new to Keyword Magic tool, see how to make the most of its capabilities. This update brings you 2.1 billion more keywords compared to the last update! Check all the databases available in Keyword Magic tool. To start your keyword research go to Keyword Magic tool, type in a keyword and select a country database. Once you’ve clicked on the ‘Search’ button, the tool will provide you with millions of keyword suggestions. You can also change databases while you’re doing your keyword research. What do you think about this update? Let us know if you’d like to have other databases added to the tool and share your feedback with us at [email protected]. Stay tuned!